A little over half a year has passed since Consilio acquired Advanced Discovery. Now it has acquired DiscoverReady, bringing its presence to more than 70 offices, review centres and data centres in 11 countries. In the Consilio press release, Consilio CEO Andy Macdonald refers to Consilio’s “strategy to invest in differentiated solutions that result in a superior and consistent client experience.” Andy Macdonald is too shrewd an operator to use words like “differentiated solutions” without purpose, and I spoke to him to find out what he meant by that. What, I asked, did DiscoverReady brings to Consilio’s already large stable beyond more offices, employees and clients? One differentiator goes right back to DiscoverReady’s foundation when it elected to focus on managed review from the beginning, and to do so only for corporate clients rather than law firms. It was, Andy Macdonald said, the first company to have a successful implementation of per-document pricing, creating workflows which would make that model work for them and for their clients. Its analytics were baked in from the beginning, aimed at speed, quality and accuracy, including the ability to limit the downside to itself by getting its numbers right. It must have been doing something right for its clients, because it showed a remarkable ability to hold onto them even when its parent company hit financial problems a few years ago. Many clients flee from businesses in that situation, but DiscoverReady’s clients stuck with them and continue to speak highly of them. DiscoverReady has three offices, in Charlotte, New York City and Southern California. As an outlier to this purely domestic set-up, it has a data centre in France, developed for the benefit of a particular French client. Consilio will make good use of this – it has learnt that while EU-based companies stand in principle behind the idea that the EU is one place, they like to keep their data in their own countries. The DiscoverReady website, with its three main headings, Respond, Comply and Protect, stands out for its focus on business problems rather than its own services. Andy Macdonald said that the client focus which appears from the website reflects the problem-solving mindset of the company. The press release says that the transaction (which is now closed) will be followed by “an integration period of several quarters as the two businesses align systems and processes”. 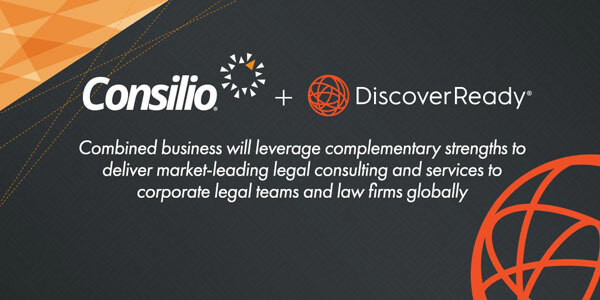 Coming so soon after Consilio’s integration with Advanced Discovery, this seems hardly surprising – there is only so much that even the biggest company can do in a couple of quarters whilst continuing to develop the newly merged businesses and get the work done. When I last spoke to Andy Macdonald, just after the Advanced Discovery acquisition, one of his points which stuck in the mind was that companies which are seen to be successful attract successful staff. Good applications continue to pour in to Consilio, many for project management positions. This endorsement by those who work in the industry is as good an indicator as one needs of Consilio’s perceived success. This entry was posted in Consilio, DiscoverReady, Discovery, eDisclosure, eDiscovery, Electronic disclosure, Managed Review and tagged Andy Macdonald. Bookmark the permalink.